Here at Mayes and Scrine we produce a wide range of quality products. Please contact us for further details and how to order. A complimentary feed suitable for feeding to horses displaying signs of gastro intestinal problems. A unique supplement for daily feeding to horses prone to gastric disturbances. 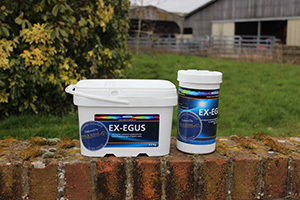 Exegus will assist in maintaining optimum gut health and function, allowing maximum utilisation of feed. Exegus supplies a unique formulation of prebiotics, amino acids, seaweed extract and specific minerals necessary to aid in the maintenance of a healthy digestive tract. It is supplied in a convenient pelleted formulation. An equine nutritional supplement formulated to promote digestive and gastric healing. 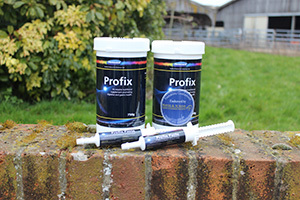 A complementary feedstuff for horses, supplements vitamins and other nutrients to support digestion and gastric health. Use during and after antibiotic treatment, during digestive disorders and incidence of diarrhoea, following deworming or times of stress. A highly concentrated equine nutritional supplement formulated to promote digestive and gastric healing. The ultimate equine supplement for hooves. Provides all the nutrients necessary to protect and nourish every layer within the hoof horn. 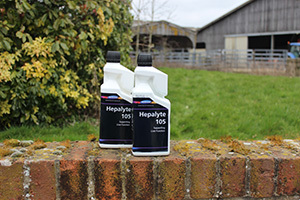 This sulphur-enriched formula will ensure that important nutrients are supplied to the horse’s diet, to optimise hoof growth and improve integrity of the hoof. It contains a concentrated source of the sulphur rich amino acid Methionine and the sulphur rich nutrient MSM. Keratin Sulphate, the structural component of the hoof horn has a high sulphur content. Biotex-80 also boasts a very high level of Biotin 80mg per daily serving. Also included are Calcium, essential for cohesion in the hoof wall, Zinc, which is required for healing of all epidermal tissue and other amino acids which are the building blocks of protein. 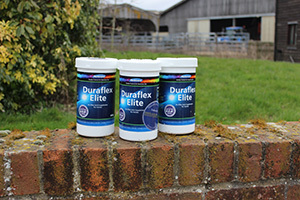 An elite joint supplement for horses. A complementary feedstuff for the nutritional maintenance of healthy cartilage in the joints of horses in training and competition work. The product is formulated to include Boswelia Serrata which is a readily available herb believed to have soothing and relieving properties. This powerful blend, which also includes Chondroitin Sulphate, Hyaluronic Acid, Glucosamine HCL (99% pure) and MSM makes this product highly effective in veterinary use. To supplement vitamins and other nutrients to support liver function. The liver is important for metabolism, secretion of bile, carbohydrate metabolism, fat metabolism, drug metabolism. A very palatable Iron, B-Complex and Cobalt enriched syrup on a Sorbitol base. Duratone also contains Sorbitol, which enhances the serum concentrations that result from the oral administration of Vitamin B12. Competition horses need dietary supplementation of B complex vitamins and Iron, as these nutrients are needed for red blood cell formation and important metabolic functions relating to exercise. 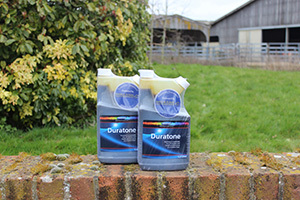 Duratone will supply these nutrients to fortify and strengthen performance horses, which will ensure that their full athletic potential is expressed in competition. It can be effectively used to support post viral recovery. An equine nutritional supplement formulated to promote and maintain optimum health. VMZ-25 is a complementary feeding stuff designed to provide a supplementary source of vitamins and trace elements to all performance and competition horses and ponies. It is particularly indicated for horses on pasture, horses being fed just grain and hay, or as a nutritional adjunct to horses recovering from illness. Myocel-BCS is a complimentary feed for horses containing a high concentration of Amino Acids, as well as the important antioxidant Vitamin E. The amino acids derive primarily from a pea protein isolated by selective precipitation. Amino acids are essential for the formation of muscles through protein synthesis, and supplementary feeding is particularly important to maintain and improve muscle mass during periods of intensive exercise or competition, during rehabilitation following injury, for underdeveloped horses, and during periods of pre-training or sales preparation. Vitamin E is a fat soluble antioxidant which protects muscle cells from the damaging effect of free radicals. 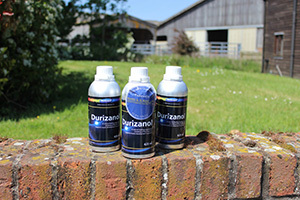 Durizanol is a feed material which provides a source of concentrated Gamma Oryzanol. It contains Tocotrienols and Tocopherols to support muscle development and growth also enhances the metabolism of stored fat for conversion to lean muscle. ProSetol is designed to be fed as a nutritional adjunct to maintain normal nervous function. 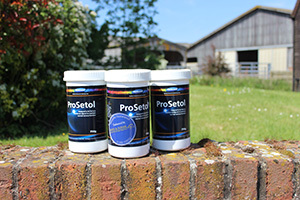 PreSetol is a feeding stuff supplying complementary levels of L Typtrophan and Magnesium, as well as the live yeast Saccharomyces Cerevisiae. It is designed to be fed as a nutritional adjunct to maintain normal nervous function. L Tryptophan is a feed additive which is associated with Serotonin production. Feeding Magnesium to nervous horses helps to re-establish balanced Magnesium-Calciaum levels. S. Cerevisiae enhances the activity of fibre digesting bacteria in the large intestine, assisting the maintenance for a normal pH within the hind gut, and thus improving both the general health and welfare of the horse.